The Mermish Council has just declared that all land-dwelling mers but return to the ocean. Pronto. But there's no way Jade is going to let her mom, or Luke, her...boyfriend? mer-guy-friend?, disappear into the deep, dark ocean. Again. After all, a girl's got to have a date to her first dance. If you remember back last Summer we had the opportunity to read book two (Real Mermaids Don't Hold Their Breath) of the Real Mermaids Series. I have to say this book was just like the second one, which I loved, but with a new scenario. You're back in Jade's world as she embarks on another yet fun/drama/teenage adventure. Between being a mermaid and trying to find the perfect plus-size dress for the Fall Formal, Jade has her hands full. This story was filled with a great story-line that any young teenage girl would love and relate to in some way. It's a bit different from the vampire books out there and gives you a tale about a mermaid. Filled with drama and different situations that get resolved and not leaving you hanging. What I love about this entire Real Mermaids Series is that you can start from any of the books and not get lost. The characters are easily represented and the story-line is easy to follow. Although I'd recommend reading all three so you can see just how far Jade has come from book one to book three. WANT TO WIN YOUR OWN COPY? BE SURE TO ENTER OUR GIVEAWAY BELOW! Disclosure: All opinions are my own. 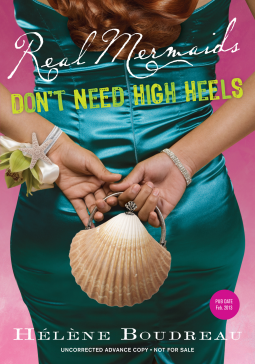 I received Real Mermaids Don't Need High Heels at no cost for the purpose of this review and book tour. No other compensation was received.